The Cuisinart Pressure Cooker is safe, easy to use, cooks up to 70% faster than conventional methods and cooks healthier. Steam trapped in the pot builds up pressure that creates hotter temperatures, and the pot is so tightly sealed that vitamins and minerals can't boil away. The CPC-600 features variable pressure and temperature settings along with browning, simmering and sauté functions for perfect roasts, stews, vegetables, cheesecake or custard. The cooker is absolutely safe, with a lid that has to be locked in place before pressure builds, and stays locked until pressure is released. 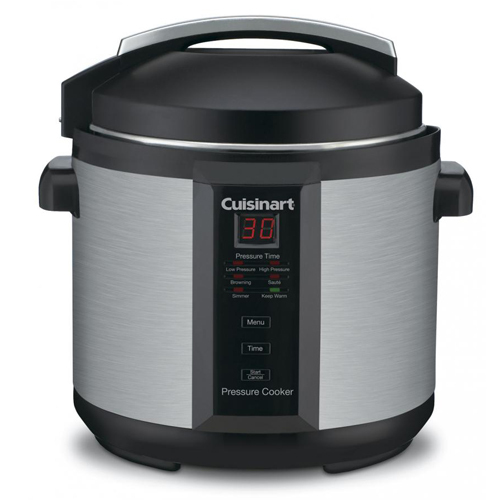 The Cuisinart Electric Pressure Cooker has many exciting features for users of all types. You can extend the lifetime of your Cuisinart Electric Pressure Cooker with the purchase of a FactoryOutletStore Factory Protection Plan. See the Cuisinart Electric Pressure Cooker gallery images above for more product views. The Cuisinart Electric Pressure Cooker is sold as a Brand New Unopened Item.